Utflykter från Praia do Forte i Brasilien. Här är vårt utbud av guidade turer och utflykter i Praia do Forte i Brasilien. 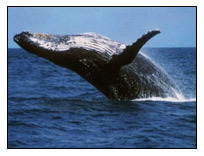 This activity starts with a presentation about the life and behavior of the Jubarte Whale. It takes place at Baleia Jubarte Institute in Praia do Forte and it lasts approximately 40 minutes. After the presentation, tour on a boat where the whale watching begins. This tour is accompanied by an environmentalist guide who speaks four languages such as Portuguese, Spanish, French and English. Fruit and mineral water are served at a specified time during the day. 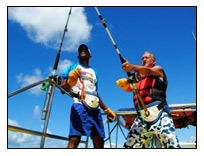 We offer a Deep Sea Fishing on TROLLING. This type of fishing happens with the boat in movement. The tour is guided GPS, allowing different species of fish to be followed and found.The most common fish found are tuna, Xarèus, Sororocas, Bijupirás, Bonitos e Dourados. Fishing equipment is available: 3 fishing poles, completed reels, belt, suspenders, gloves and a wide range of artificial bait. We also offer mineral water, soft drinks, fruit, sandwiches and biscuits. 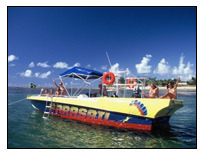 Depending in the condition of the tide, the diving happens in Praia do Forte or Itacimirim. It is necessary to book 24 hours in advance. The tour starts with a theory class about the function of the equipment, the basic rules and communication signals. Just after that…diving! For people with no experience, the person will be accompanied by an instructor at all times. For people who have Padi credentials, please show it to us. 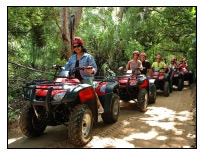 We offer two different routes on this tour. 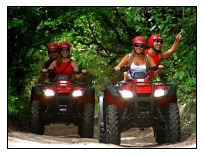 Our buggy driver will take the clients track passing to the Castle, Sapiranga Reserve and Pojuca River where we stop, we go walking for around 10 minutes until the place where we take a rest and go swimming. On the way back, we take the same track to arrive at the starting point. 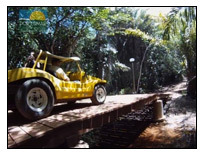 Our buggy driver will take the clients track passing through the Sapiranga Reserve and Pojuca River where we stop, we go walking for around 10 minutes until the place where we take a rest and go swimming. On the way back, we take the same track to arrive at the starting point. This tour takes place in Canadian style canoes with a capacity for three people rowing. This tour is accompanied by an environmentalist conductor. We cover the Timeantube lake, bordering its small islands for almost 30 minutes. We are able to see aquatic vegetation and observe a wide range of birdlife such as Owl, Hummingbird, Great Kiskadee , Jacana (Jesus bird), Parrot and Kingfisher. 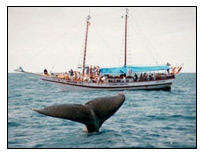 This expedition will also stop at Dende Island for 10 to 15 min walking to observe the Brazilian flora and fauna. The tour starts with 15 minutes walking to the natural pools. They are formed between the coral reefs, with crystal-clear-water. These natural pools form natural aquarium with wide range of colorful fish, corals and crustaceans. The tour starts with a test driving lesson to make you secure on driving our bikes. After that, we take 20kms track passing to the Castle, Sapiranga Reserve and Pojuca river where we stop, than we go walking for around 10 minutes until the beautiful place where we take a rest and swim. On the way back, we take the same track to arrive at the starting point. The tour starts with a test driving lesson to make you secure on driving our bikes. Then we go to one of the most beautiful trails of Sapiranga Reserve, an area that houses a transitional vegetation between the dunes and the Atlantic Secondary, the destiny is the Pojuca River ,where you gonna stop to go diving, swimming and rest. 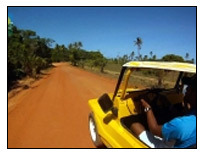 Jeep Tour visit 2 diferent turistic places in Praia do Forte and region. First, it goes to Garcia D’Ávila Castle (01:00 stop) then the group goes through Sapiranga Forest Trails ultil the Enviroment Center for another 01:30 stop. After that, the Tour will return to Praia do Forte following the same trail. 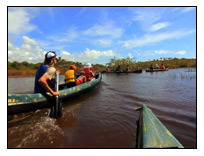 This boat tour goes 3 miles amoung the coast reaching Itacimirim beach where the famous brazilian navigator, Amir Klynk, arrived after crossing the Atlantic ocean from Africa. 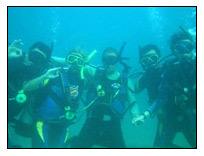 During the low tide mask and snorkel are available for diving at the natural pools. 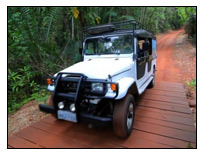 Jeep Tour leaves Praia do Forte to visit Imbassaí Beach (01h:00 stop) and Santo Antônio Beach (another 01h:00 stop). On the way back, this Tour will stop for lunch at Sombra da Mangueira restaurant (01h:30) located in Diogo Village. 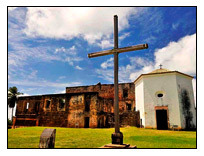 Jeep Tour leaves Praia do Forte to visit Itacimirim Beach (01h:00 stop) and Guarajuba Beach (another 01h:00 stop). On the way back, this Tour will stop for lunch at Prefeitinho restaurant (01h:30) located in Guarajuba.